The Evansville economy has slowed significantly since the turn of the century. The index of economic activity maintained at the University of Evansville reached its maximum in 1999, posted an inconsequential decrease in 2000, but fell by 3.4 percent in 2001. This compares to a 0.3 percent growth in national real Gross Domestic Product (GDP) over the same time period. 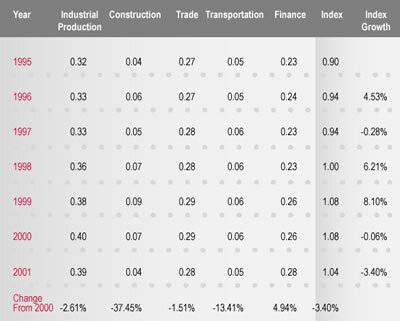 The decline was spread broadly, but there were sharp declines in the construction and transportation sectors. The only component of the index to show positive growth was the financial sector. The index uses electricity sold to industrial users as its proxy for industrial production. The total value of new construction permits in Vanderburgh County is used to measure construction activity. Transportation is measured by annual enplanements at the Evansville Regional Airport. 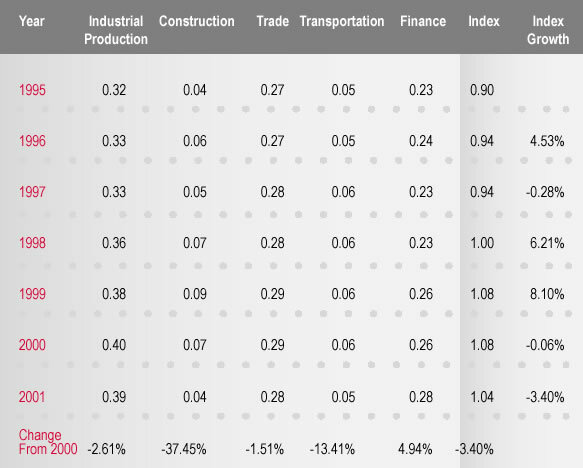 The index uses metropolitan area employment in wholesale and retail trade to measure the level of activity in the trade sector, and employment in finance, insurance, and real estate as the finance component of the index. The base year for the index is 1998 (see Table 1). The future is uncertain, but it can be viewed with guarded optimism. Recent announcements of the expansion of Toyota and its suppliers, the arrival of Ford in Gibson County, and the recognition of the area labor force's work ethic all speak well for the future of our area. The obvious downside risks include the uncertainties of international terrorism, the engagement of our military forces abroad, and the effects of further uncovered financial chicanery on the financial markets.